The word Aborigine is a concatenation of the Latin words ab (from) and origine (beginning) meaning being there from the beginning or native. It is the second word the white people used for the natives after calling them Indians. Initially the word aborigine probably involved some kind of disdain. Recent findings in Kakadu Nationalpark show that there might have been human life in Australia for up to 60.000 years, while referring to former estimations the aborigines came overland from New Guinea about 40.000 years ago. Until the year 1788 when Captain Arthur Phillip landed in Sydney Cove with the First Fleet ( Australia's history) the aboriginal population grew up to 300.000 inhabitants. From that time the population had been more or less systematically decreased by the white men. 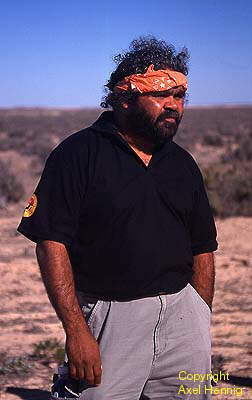 Aborigines were shot recklessly and were kept away from the waterholes they had used ever since. A lot of diseases spread when they were forced to use water from sources that were infected by new domestic animals the white men had brought into the land. In Tasmania the extermination of aborigines ended with the death of Truganini, the last Tasmanian native, in 1876. Against her will - but as she guessed before her death - her skeleton had been showed to the public for 50 years in the Tasmanian museum. It was a hundred years after her death when her skeleton was burnt and - finally following her last will - was given to the sea. Already in the end of the 19th century missionaries founded reservations for aboriginal people. These reservations were built and established by white men ignoring the aboriginal way of living. The natives didn't care about a house, money or a good job. Because they couldn't be forced to accept the white men's habits an integration - in the way the white men intended - was impossible. By wrecking the social system and shooting aborigines just for fun the population decreased dramatically. In 1911 the continuity of the race was in great danger. In 1918 it passed into law that half-caste children had to be taken away from their parents and should be risen by foster parents or in reserves. 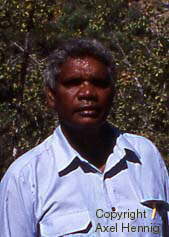 The difficulties with the planned integration led to the foundation of more reservations in the 1950ies to enhance the control over aboriginal people. They were not to possess land and were not allowed to decide about their jobs. Those not living in reservations worked e.g. on camps of farms where they were skilled but cheap workers and where they ironically had to help their oppressors to take over and cultivate their land. It was not before 1967 - when there were about 300 reservations - that aborigines got full civil rights. Since then they have been free to live in reservations, to follow their traditions living in the bush or to integrate themselves into the modern Australian society. But even those who chose the Australian society are at the end of the social structures and work in mostly underpaid jobs or suffer from racial prejudices. Most of them live in the outskirts in huts of corrugated iron and are addicted to alcohol. Because of deficient food and medical care todays death rate of aborigines is twice higher than the one of white people. A further step forward was the Lands Right Act in 1976 that claims the aborigines' possession of their reservations and other traditional regions. Nevertheless the government kept the right to use natural ressources within these areas (e.g. mining) and the aborigines' opinion was often ignored when decisions were made. In 1985 the nationalparks Uluru/Kata Tjuta and Kakadu were given to the aboriginal people. Today there is still racial discrimination of aboriginal people. But the intention of adjusting to the whites' values is more and more accompanied by a regrowing pride of the own traditions. In addition the interest in aborigines' culture has been increasing in the international public during the last couple of years - not at all because of the Olympic Games 2000 in Sydney that were broadcasted into the whole world. Perhaps that can help to reach a state of equality between white people and natives. In a historical speech Prime Minister Kevin Rudd says sorry to the Aborigines. On February, 13th 2008 he apologises "for the laws and policies of successive parliaments and governments that have inflicted profound grief, suffering and loss on these our fellow Australians”. [...] "To the mothers and the fathers, the brothers and the sisters, for breaking up of families and communities, we say sorry. And for the indignity and degradation thus inflicted on a proud people and a proud culture, we say sorry." - The apology was directed especially at Aborigines forcibly taken from their families as children in assimilation policies that lasted from the mid-1800s until 1970. During that time up to a third of Aboriginal children were taken and are today called the stolen generation.